Among the clever folk in our local small business community are Bertrand and Craig who, amongst other things, bring a range of La Rochere glassware in from Bertie’s homeland, France. You may be thinking that I’ve lost my marbles stocking their wares given my passion for Australian manufacturing but I’m also passionate about things with provenance and any quality good that is designed to last and doesn’t end up in landfill within 12 months because it is so well made. And, of course, their “Abeille” or bee range gets my vote simply for celebrating the sisterhood! La Rochere French glassware, tableware and dinnerware – tumblers, wine glasses, water glasses, candleholders, plates, bowls and carafes – are for living each day as if it were your last. It is made at very high temperatures and is famous for its uniquely clear glass and hardiness. Made in France since 1475, the La Rochere factory is the oldest operating glass factory in Europe. We’ve got some of their bestsellers and we’ve got them in cartons of 6 with a 10% discount. Historically each King of France (yes, they were all kings) chose something as their emblem. For instance Louis XIV chose the sun. Napoleon chose the bee for its industriousness and to signify that through unity you achieve strength. It was a rallying cry for his army. The bee design is no less relevant today. Whether you like to feast as Kings and Queens or whether you simply admire the industry of our bee comrades, the elegance and simplicity of the Napoleonic Bee range from La Rochere is fitting. 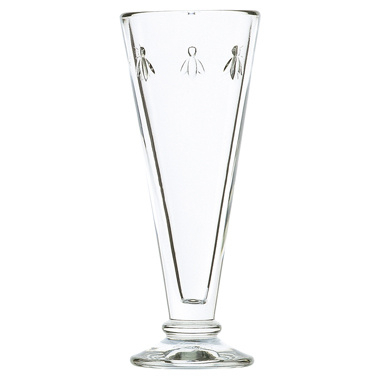 And, like its namesake, the La Rochere glassware goes the extra mile by being dishwasher safe. Happy to bring you more great quality, bee goodies!